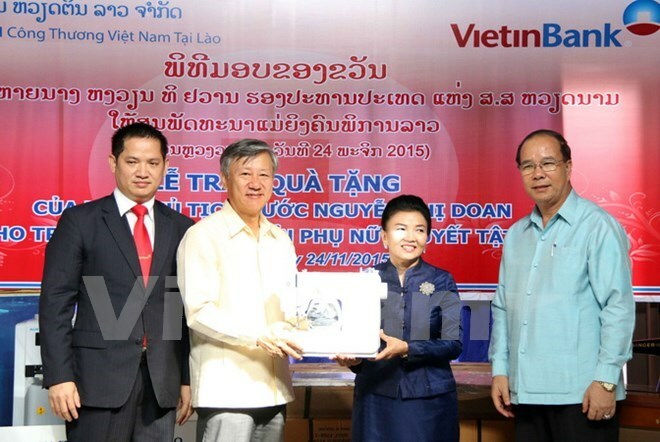 Vientiane (VNA) – Vietnamese Ambassador to Laos Nguyen Manh Hung handed over gifts from Vice President Nguyen Thi Doan to the Lao Disabled Women ’s Development Centre in the Lao capital city of Vientiane at a ceremony on November 24. The gifts worth around 9,000 USD include 12 sewing machines and office furniture items. The Ambassador said he hopes the centre will expand its operation so that more and more disadvantaged women will receive vocational training and live a better life.